Saturday, October 27, 2018 at 8 p.m.
Tickets $20. Student rush $5. Available online at www.legionarts.org or call (319) 364-1580. Sunday, October 28, 2018 at 3 p.m. Available online at www.englert.org or call (319) 688-2653. Watch out! We’re opening our 23rd season with one of Iowa’s cutting-edge performers – spoken word artist Akwi Nji. Through three works for violin, cello, and spoken word, we explore love through the stages of life. The title work of the program was commissioned by board member Tom Carroll as a gift to his wife Patrice for their 40th anniversary. 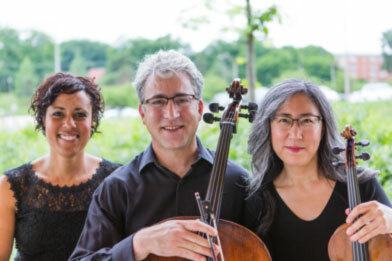 Co-written by Red Cedar composer-in-residence Stephen Cohn and guest artist Akwi Nji, Love & Life is a marriage of words and music, taking us on a journey of love. Audiences will also be treated to Conversations by David Ott, and “Long Dance, Slow Revolution,”a poem by Julie Hanson presented with music by Michael Kimber. You won’t want to miss this momentous collaboration! Special thanks to Artist Sponsor, Schultz Strings. The October series of concerts and residencies is made possible by both the Program Grant Fund & the Linn County Fund of the Greater Cedar Rapids Community Foundation, the City of Marion, the McIntyre Foundation, the Giacoletto Foundation, and the AEGON Transamerica Foundation. Additional support comes from Farmers State Bank, GreatAmerica Financial Services, the William P. Whipple Fund of the Greater Cedar Rapids Community Foundation, the University of Iowa Community Credit Union, Rockwell Collins, Mount Vernon Bank & Trust, Hills Bank & Trust, the Abbott B. and Joan M. Lipsky Fund, the Carleen & Eugene Grandon Charitable Foundation, and Friends of Red Cedar Chamber Music. Saturday, April 6, 2019 at 7 p.m.
Tickets $20 at the door. Thirty and under $10. Sunday, April 7, 2019 at 7 p.m.
Something old, something new, something borrowed, something blue! We’re not sure yet about something blue, but we have the rest of it covered. Founding directors Jan Boland and John Dowdall return as guest artists after a two-year hiatus. Carey Bostian and Miera Kim can’t wait to make music with their mentors and re-present them to so many familiar audiences. Look for old favorites, new favorites, great new arrangements of Dvořák and Bach, and a special appearance by Macavity the Mystery Cat. Hmmm….something blue….may have to be a surprise. Special thanks to Artist Sponsors Juanita Dennert, Don & Irene (Naxera) Hamous,and ImOn Communications. 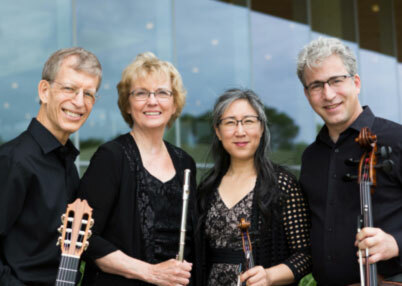 The spring series of concerts and residencies is made possible by the Program Grant Fund of the Greater Cedar Rapids Community Foundation, the City of Marion, the McIntyre Foundation, the Giacoletto Foundation, and the AEGON Transamerica Foundation. Additional support comes from Farmers State Bank, GreatAmerica Financial Services, the William P. Whipple Fund of the Greater Cedar Rapids Community Foundation, Rockwell Collins, Hills Bank & Trust, Foster’s Heating & Air Conditioning, the Abbott B. and Joan M. Lipsky Fund, the Carleen & Eugene Grandon Charitable Foundation, and Friends of Red Cedar Chamber Music.